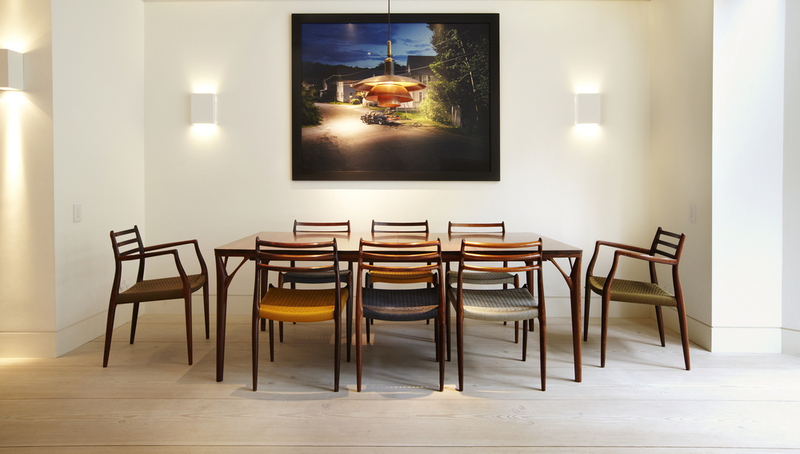 Paere Dansk's modern furniture has been made in Denmark since 1944. Today we sell vintage chairs and tables made during 1944-1969 along side newly made editions of the original designs. Newly made editions, like all vintage chairs, are only made of solid wood. During the 1950s and 1960s, whilst most in Europe (and many in Denmark) were developing furniture made of new synthetic materials such as plastics, laminates and foam, Danish architects such as Hans Wegner, Niels Otto Moller and Helge Vestergaard Jensen opened a new chapter in the history of solid wood furniture. In collaboration with traditional cabinetmakers, they advanced 19th century technologies for turning solid wood so as to produce 3-dimensionally complex, or sculptural, forms. The turned but rough-hewn wood mouldings required extensive hand finishing - rasping, detailing, assembling, polishing and upholstering - and so made use of 100s of years of woodworking traditions. This combination of mechanisation and handcraftsmanship gave rise to unsurpassed quality and a distinctly Danish “look” combining organic 3-dimensional shapes with clean and modern 2-dimensional lines.